It's been a while since I have been here. So much happening for me that I had to put the writing career on hold. Many of you know I was in the process of completing Scorpion, the follow up to Serpent. I did get that book about 50% completed, but I met an amazing man through a wonderful new "on line" friend. This amazing man took me under his wing and taught me a lot about the craft of writing and convinced me to go back and re-write Serpent. So I am doing that. It has been a long and difficult journey and I am beginning to see the light at the end of the tunnel. I am hoping it will be done by late spring of 2013. Once it is completed and posted on Amazon.com and here on my blog...I will have a special offer for all of you that ordered the original Novel. I will have a limited number of the new novel which is going to be retitled The Head of the Serpent .... signed copies available to previous owners of Serpent for a one time only price of $10.00 each. I'll keep you posted as to when this will happen. You can email me anytime from now on.... here...to washburnchronicles@gmail.com to request your copy. It will be on a first come first served basis, and the limited edition will be under 100 copies. Thanks to all of you for your patience and kind words of encouragement. You can also join me on facebook at rondarling-storyteller. Everyone takes for granted our safety here in this great country of America. We are safe because real people like Nick Washburn actually exist. They may be special forces, or CIA or black operatives in other organizations, but because they are there, we can feel safe. 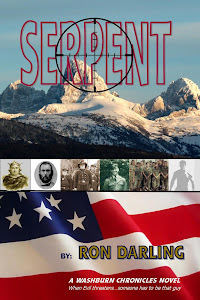 SERPENT is a story of what those men and women do and how they do it. It is a story of what would happen in America if we let our guard down and allow the evil to grow. We must be ever vigilant and not let those that would do us harm to get even a finger hold in our country. 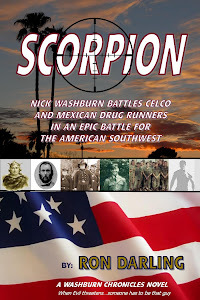 SCORPION, my next novel addresses what will happen if local, home grown radicals unknowingly mix with a Mexican drug Cartel. No longer just a war on drugs, Nick Washburn and his team must fight to stop the killings in the Southwest. To do that Nick and his men must travel deep into the bowls of a drug cartel and hunt them down in Mexico. This truly is a great day. SERPENT has begun to find it's way into the hearts and minds of more and more Americans. I continue to receive such warm and caring reviews. One reader, Anthony from here in Arizona said, "I just finished your book, I loved it." Another, Donna in North Carolina, "I stayed up all night the last two nights, I just had to finish this great story." Let not your heart be troubled...sorry Mr. Hannity...stole your line....Nick's next adventure is going to undergo some re-writes and I have to finish it, but it will be out soon. I promise more fun, more action and just as much love as in Serpent. Good News Bad news. I have met a profound man who is a writers coach, an editor and a master at the trade of writing. He is a magnificent, gentle, patient, caring and loving man from the Southeastern portion of these great United States. His resume is long and impressive, and his heart and soul are immeasurable. He has, for some unknown reason chosen to take me under his wing and help me to become a better writer. Retired, he only accepts a limited number of projects and I am blessed to have been accepted into his life. Many of you have written me to tell of how much you loved Serpent and can't wait for Scorpion. I can't wait to share Nick's next adventure with all of you as well, however I am taking a 2 month, or more break from writing while I learn the lessons this man can teach. I will tell you more about him at a later date. For now, the writing career is on hold so that I can improve and give you a far better reading experience that the last one. Not that the last one was in any way bad...it's just that I know with this man's assistance and instruction I have an opportunity to become a far better writer. Thanks so much for your support. I still plan on holding the competition for the battle blade so work on those videos...and in a month or so I will re-ignite the fires of creativity and get that contest off the ground. I am truly excited about what this will bring to my work. I appreciate your patience while this grasshopper learns from his new found master. Hi kids. I am excited to announce an upcoming new contest. I am formulating the rules and prizes and will have everything nailed down by the end of this week...so stay tuned for further developments. While there never was a line, there was always someone talking to me about the book all day long at Gifts to Go. The time flew by and at 3:15 I checked my phone for the time and realized I had been there almost an hour past the designated ending time. We sold and signed some books, made some new friends and in general had a great time. Thanks to Tammy for being such a great host. We look forward to a long and mutualy profitable relationship with this great little store. They have some very unique items and specialize in books by local authors. They are located in Barnaby Street Shoppes at 113th ave and Bell. Check them out...it is worth the time to stop in and meet Tammy. This video was put together by my son Chris...it gives the flavor of the intensity of SERPENT. Enjoy. Just click on the link "See what SERPENT is about above". WHAT ARE THE WASHBURN CHRONICLES? My name is Ron Darling, I am the author of the Washburn Chronicles. I have been an avid reader of many authors and especially Vince Flynn, Brad Thor and Clive Cussler for many years. Their work has always inspired me and eventually led me to sitting down and writing Serpent. While writing it I realized I was opening a story line that could be never ending. A chronicle of the hero's ancestors and their contributions to our world. Nick Washburn is the current hero for our time, he is "that guy" the one the president calls when something has to be done that no one else can handle. Like SEAL team 6 is in real life he does what no one else is capable of in my novel. His story is one of DNA. His father, and his father's father and ancestors all the way back to the Kings of France have been the ones people looked to in times of need. The current stories Serpent and coming soon Scorpion tell tales of Nick and his team, as well as many other heros and what they do and go through for all of us. In future books I will venture into the past and tell stories of his ancestors...those who were "that guy" and in some cases "that gal" in times gone by. My stories are a tribute to the real life heros, the men and women of our Armed Forces and Police, Firefighters, and the rest of Americans who strive to keep us the land of the free because they are the brave. Battle Blades Knives as used by Nick Washburn in the novel Serpent. Reviews of the book are welcome as well. For hundreds of years my ancestors and I have been the ones who gave all to keep the world safe from evil. I am a direct descendent of the Kings of France who helped fight the fight against the Muslim invasions in the Crusades like I now do against the radical islamic jihad that has been launched against the free world. I am the presidents last best recsource when he needs someone who can take out the trash. To most of you, I don't exist. Such is the life of a black operative. I do all the work, someone else gets the glory, and that's okay with me. I live to serve this great country and stand at the ready to do whatever is needed... where ever it's needed. My wife Melinda is the most beautiful woman inside and out I have ever known. She is strong and shares my love of this country and understands my need to be....that guy. Ron Darling's first novel. Meet Nick Washburn and the gang at the Fortress. BUY YOUR KINDLE EDITION HERE....NOW! book. Can't wait for the next in the series." bit!) of espionage, U.S. covert operations, and red, white, and blue fire power! and the character evolve. Again Mr. Darling, well done." The inspiration for this novel came from my son Chris. His incredible idea and his genius imagination gave me the concept to build this story on. Without him and the support of my wife Nancy and our son Jeremy and daughter Angie I would have never had the courage to take this step. I am a lucky man, they are all the best. author of the Washburn Chronicles.